J.J. had told me and then I read the script, and then it was sort of shifting. The ending was always pretty similar, and then I was told there was a new, I guess, a slightly different beat added that I was told, which was awesome. Because it’s nice to be told a thing, and then you can experience it with the filmmaker. But also, we don’t always know how it’s going to turn out. We did the thing on this side of the camera, but we don’t know how it’s going to turn out. So I’m as excited to see it as everyone else. Get ready for some surprising shots. There’s so much to unpack. 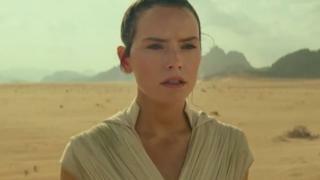 Prior to debuting the first trailer, the Episode IX panel at Star Wars Celebration brought out the cast and crew, with host Stephen Colbert inquiring about what The Rise of Skywalker might entail. During the presentation, still were revealed of each of the characters, and they didn’t disappoint. Let’s dive into what we were shown.